I experienced my own personal Make Way for Ducklings recently. As I was leaving the Museum one the evening, I spotted a mama Mallard marching purposefully across Library Park in a northeasterly direction, followed closely by her ducklings. They were tiny! Mama Mallards try to lay their eggs in nests well protected from potential predators, such as raccoons and coyotes. This means that mothers sometimes nest as much as a mile away from water. Given the size of the ducklings and their presence here in Library Park, I believe these were newly hatched ducklings being lead by their mother to water for their first swim. I watched mama lead her offspring eastbound on the sidewalk of Oak Street, across Peterson (in the crosswalk no less) to Whedbee, where again she crossed in the crosswalk north bound towards (oh no!) Riverside. She followed a wooden fence on the west side of Whedbee until she reached the T intersection. What a nightmare! It was 6pm on a Friday evening, traffic whizzing by on Riverside, a very busy, 4-lane street, filled not just with regular auto traffic but semis, too, taking a short cut off of I-25 to connect with 287 to Laramie, Wyoming – all of the vehicles easily traveling 50 mph or more. I sat in my car across the street from her and watched. She approached the intersection and upon hearing a vehicle approach, she dashed back against the wooden fence, ducklings hot on her webbed toes. She would crouch low, only the top of her head showing. She blended in so well to her surroundings that sometimes I lost her, even though I was trying to keep a close eye on her! After many false starts, she took the plunge, so to speak, off the sidewalk, six ducklings in a row behind her. I appointed myself Officer Mike in this life-imitating-art crisis. With cars coming from both directions, I gunned my vehicle into the road, figuring those other drivers were more likely to see me in my car than the little fluffy balls in the street. And I was right – as I yelled and held up my left hand at the driver of a large white SUV to make him stop, he looked surprised, if not a little angry, to see me in his right-of-way. I knew the instant he saw the ducklings, through, because he broke out with a big grin! The ducklings safely crossed the street and I let my car idle at the curb where they attempted to jump up onto the grass to follow their mother. One, two, three made it up. Three didn’t, jumping over and over and landing on their backs almost every time. To my horror, they took off on their own, following the gutter north. I drove slowly behind them with my hazards blinking so that people would pass me on the left and not come close to the little hatchlings on the right. They made it to the entrance of the auto repair shop on the corner of Mountain and Riverside and ran up the ramp. I pulled in after them, hopped out of my car and “herded” them back in the direction I last saw mama. I didn’t see mama again; however, ducklings are known to become separated from mothers. Most times, mama will circle back through an area “calling” for the ducklings, who constantly peep. In this way they can reunite. 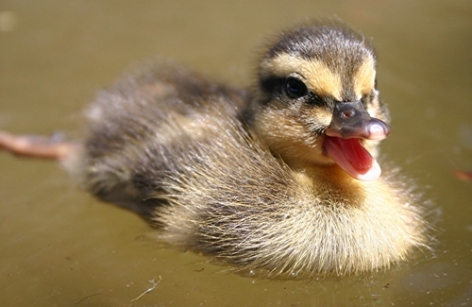 Since my adventure, I’ve done some reading about ducklings. Most websites I read stated that it is best not to interfere with mamas and ducklings beyond stopping traffic when they attempt to cross a street. By interfering, you can unintentionally make a bad situation worse. My herding may have done just that but I’ll never know. I am contemplating, though, putting a little “duckling ramp” on the north side of Riverside in case mama Mallard nests over here next year, which is likely, because females usually return to their own hatching locations for nesting as adults.